Dateline San Diego, CA, February 25, 2019 – Today, the San Diego-based nonprofit, Public Watchdogs, is launching a hard-hitting TV ad campaign aimed at raising public awareness about the imminent dangers of storing nuclear waste on the beach at San Onofre State Beach Park. The ads, which will run on local San Diego TV stations, will begin running today. The nonprofit is partnering with award-winning public affairs and public relations agency, Focuscom Inc., to help spread the word and mobilize the public. 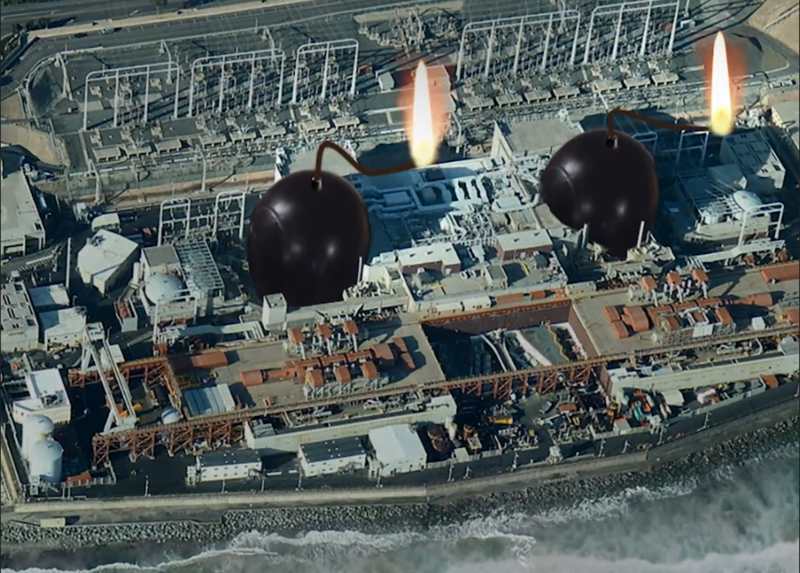 To kick off the campaign, Public Watchdogs has released a 15-second video highlighting the imminent risks of storing nuclear waste 108 feet away from the crashing surf and sugar sand beaches at San Onofre State Beach Park. Southern California Edison, has been swiftly moving 3.6 million pounds of deadly radioactive nuclear waste to its newly constructed beachfront nuclear waste dump at the site of the failed San Onofre Nuclear Generating Station. The nuclear waste dump is located fewer than 108 feet from the beach. “It’s a ticking time bomb,” says Nina Babiarz, a public Watchdogs advocate. The commercial is the first of a series of awareness-building efforts to inform those who live, visit or commute in the San Diego and Orange County to help raise awareness of the lethal threat of nuclear waste. The campaign’s goal is to inform residents of the dangers, and to pressure local government leaders to push for better nuclear waste containers in a safer location. Public Watchdogs is asking residents and community leaders to text TIMEBOMB to 99000 for a link to sign their petition and stay up to date on the latest news. Click here for a One Page Fact Sheet and backgrounder on the San Onofre Nuclear Waste Dump. Incorporated in 2016, Public Watchdogs is a 501(c)3 California nonprofit. It is funded by a grant from the Moores Family and individual member donations. Public Watchdogs researches and exposes government malfeasance, and serves as a catalyst of reform by holding unaccountable government agencies accountable. For more information, visit www.publicwatchdogs.org. Focuscom Inc. is an award-winning, dynamic public affairs and public relations agency located in the heart of Downtown San Diego. Founded in 2006, Focuscom’s local roots have produced a decade of results utilizing multicultural business experiences and strong relationships with top leaders and key community groups. The team generates high-impact public affairs strategies and public relations campaigns to bring value and success to a variety of different organizations. In 2018, Focuscom was recognized by the Public Relations Society of America’s San Diego chapter and took home another Silver Bernays Multicultural Public Relations Awards for the third year in a row. For more information, visit www.focuscominc.com.